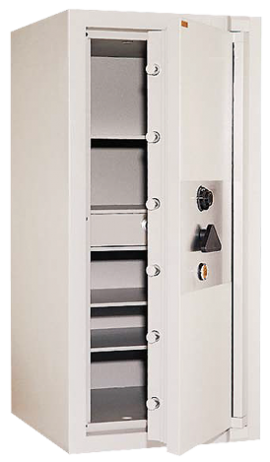 The Lion N-Series Safe is specially designed with businesses in the high cash risk sector in mind. Businesses that require a high degree of protection against the wide range of sophisticated tools and a combination of various methods of burglary attacks. Double rebates form at the leading edge of the door, increasing the N-Series Safe’s resistance against burglary. Its fire resisting characteristics are further improved by a protective body thickness of 114mm and a door thickness of 90mm. Safety and protection are further enhanced with the inclusion of drill resistant spiral bars and Dramix, which is incorporated in Lion’s specially formulated MegaMix 2 material. The Lion N-Series Safe. Any way you look at it, you’re safe. Lion’s time tested high density composite MegaMix 2. Impervious to heat cutting apparatus offering high resistance against mechanical and hand tools.Improved boltwork with double bolts at top and bottom with fixed rebate at the rear. Bolt size – 38mm diameter. Bolt heads are protected by drill resisting deflectors. Added protection on vital parts of the door by means of drill-resisting plate. So why not give us a call, you will be glad you did. Dealing with London Fire and Safe for your safe needs is so simple yet you get comprehensive information and you will always talk to one of our safe specialists based in our Queensland Office.